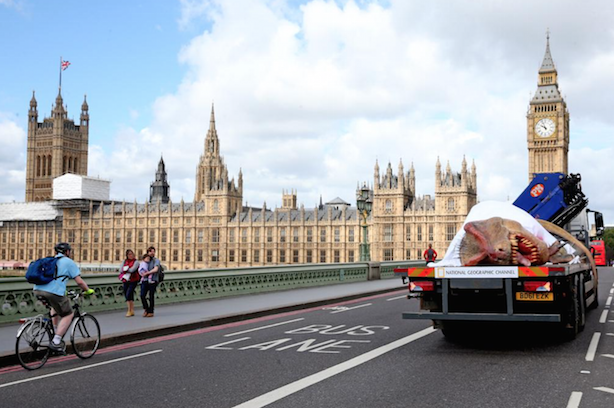 PR agency Premier was behind the high-profile campaign for National Geographic that saw a life-size Tyrannosaurus rex being driven on a truck across London. The agency, who won the brief following a competitive pitch, was tasked with creating a "bold, creative and captivating stunt" to promote National Geographic’s new programme, ‘T-rex Autopsy’, which airs on 7 June. The dinosaur travelled around London, starting at a warehouse in Croydon. It then continued to Brixton and made its way through Central London, passing by London Bridge, St Pauls, Westminster Bridge, Trafalgar Square, the Mall and Buckingham Palace. It then went on a regional tour via Tunbridge Wells, where artist Andy Billet was interviewed for regional press about the creation. Leigh Debbage, creative director at Premier, said: "We were briefed on the unique nature of the show, which literally goes under the skin of a full-size T-rex for the first time ever to reveal how the 65-million-year-old beast may have lived. "We were given an open brief to capture the imagination of the press and public and celebrate the unique nature of this show. Client Fox International Channels were keen to make whatever we did feel like an event and voyage of discovery." The 43-foot long, 13-foot tall 'dead' dinosaur was strapped to a flatbed truck, partially covered by a blood-soaked sheet on the way to its 'autopsy'. It is said to be the world’s first life-sized anatomically precise model of a T-rex, and it includes 35 gallons of blood and even fake faeces. This story was updated on 3 June with comment from Premier.